The Big Bazaar is a popular place to find inexpensive household items, clothes, and food all under one roof. However, there are a few things to be aware of when shopping. Wide range of products under the one roof. Checkout can be extremely slow. Complaints of poor customer service and overcharging. Outlets in about 100 locations across India. Sells furniture, electronics, clothes, cookware, cosmetics, household items, food, gifts, jewelry, and books. Also has special Food Bazaar outlets. Most stores open from 10 a.m. until 9.30-10 p.m. daily. There was a time not so long ago that large department stores were a completely foreign concept in India -- but not anymore. 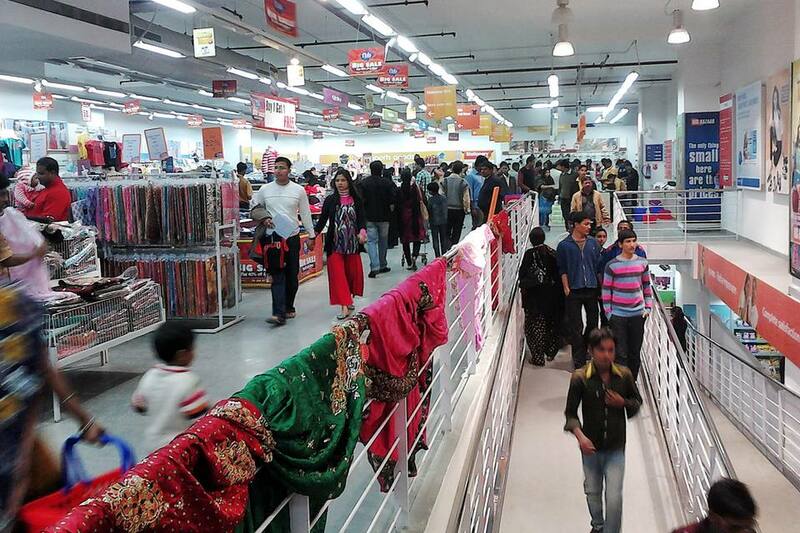 The Big Bazaar is one such department store to have set up shop across the country. Since its first outlet opened in Kolkata (and then Bangalore and Hyderabad) in late 2001, the Big Bazaar has spread to towns and cities at an astonishing rate. In 2011, the Big Bazaar opened its 200th store in India. These multi-level shopping meccas stock everything from food to fridges, and cookware to clothes. However, the Big Bazaar isn't your ordinary department store. It's been especially designed to appeal to the middle-class Indian consumer. You may be thinking, what does that mean? In short, organized chaos. The Big Bazaar was launched with a slogan of "Is se sasta aur accha kahin nahi!" ("Nowhere cheaper or better than this! "), targeting itself directly at the average Indian's love of following the crowd and scrambling for a good discount. There weren't any neatly ordered aisles at the Big Bazaar. Instead, stores were laid out to replicate a market environment, with items all thrown in together. Promotions such as "Sabse Saste Teen Din" (Cheapest Three Days) and "Purana Do, Naya Lo" (Give Old, Take New) resulted in shoppers flooding the stores, to the point that some stores became so overcrowded they had to close. In 2011, the Big Bazaar reinvented itself on the 10th anniversary of its operations. The obsession with discounts was over and the chain's bargain slogan was replaced with one focused on progression -- "Naye India Ka Bazaar" (New India's Bazaar). The Big Bazaar sought to move away from super cheap goods and pricing, to become a hip and modern retailer offering decent brands at reasonable prices. The store aimed to attract younger, more aware Indian consumers, in line with India's economic progression and social change. In 2014, the Big Bazaar underwent a further metamorphosis, and emerged with a new tagline and advertising campaign of “Making India Beautiful”. The aim was to be a part of the changes going on in India, to clean up and improve the country. The company focused on showcasing products that made life better for the aspirational Indian. To further the store's appeal to upwardly mobile younger customers, in 2015 the Big Bazaar started launching swanky Gen Nxt stores in Mumbai and Delhi. Rather than looking like a disorganized marketplace, these innovative stores are designed to provide a smart and easy shopping experience. They also stock premium merchandise, including trendy fashion for teenagers and consumers up to their early 30s. Discounts at the Big Bazaar are definitely not done and dusted through! Wednesdays are "Hafte ka sabse sasta din", the cheapest day of the week, and there are promotions on everything from food to fashion. Multi-day Maha Bachat (Mega Saving) and Sabse Saste Din promotions still run as well, during certain holidays and festivals. It's possible to have a deceptively pleasant and hassle free shopping experience at the Big Bazaar in the daytime during the week. Do note that the quality of unbranded products may be low, along with low prices to lure in customers. I've also found that the full price is all too often charged on sale items, so do check your receipt to make sure that discounts have been properly recorded. Compare the prices of sale items elsewhere, as some discounts are actually not as attractive as they initially seem. In addition, be aware of discounted items being sold close to their expiry dates. The new Gen Nxt stores are much better in terms of design, efficiency and service. Fortunately, there's one near where I live in Mumbai and I actually enjoy shopping there. It was a pleasant surprise! The aisles are wide and the checkouts are quick. The store sells gourmet food and bakery items, an extensive range of branded cosmetics, and fashionable good quality clothes that I actually want to wear. If you don't want to pay for plastic shopping bags, be sure to take your own.